Does your kid have an abnormal amount of energy? Does he dash through the house like a speeding bullet, knocking things over and inadvertently busting up the house? Does he bounce of the walls like some kind of human bouncing ball? Well, it might be time to come to grips with the truth about your child. He might be learning how to use the Speed Force and he may just be a superhero, waiting to find his calling as a crime fighter. Yes, it’s not uncommon for young kids to start dabbling with the Speed Force, the legendary power that Barry Allen uses to run at unimaginable speeds. 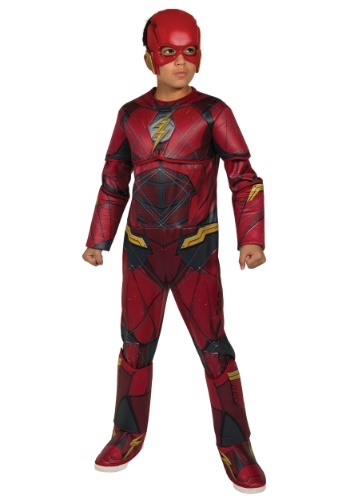 You could just ignore it and hope he grows out of it, or you could get your child this deluxe boy’s Flash costume and begin training him to join the Justice League. Don’t deny your child his chance to be a hero! This Justice League Flash costume is a child costume that fully recreates the look from the movie. It comes with a red jumpsuit that has plenty of printed details, like armor and a lightning bolt symbol on the chest. It also has matching yellow accents on the arms and waist. The costume also has attached boot covers which fit over any of your child’s shoes. Of course, it includes a mask to help keep your kid’s secret identity intact, since you wouldn’t want any of the bad guys showing up at your doorstep! Once your child has the costume on, he’ll be ready to team up with Batman and Wonder Woman to battle against the forces of evil like his favorite DC hero.